During a scheduled trip to Egypt to further develop Russia's deepening ties with Cairo, Russian President Vladimir Putin made a short stop at Syria's Humaymim air base to address Russian forces operating from the base. 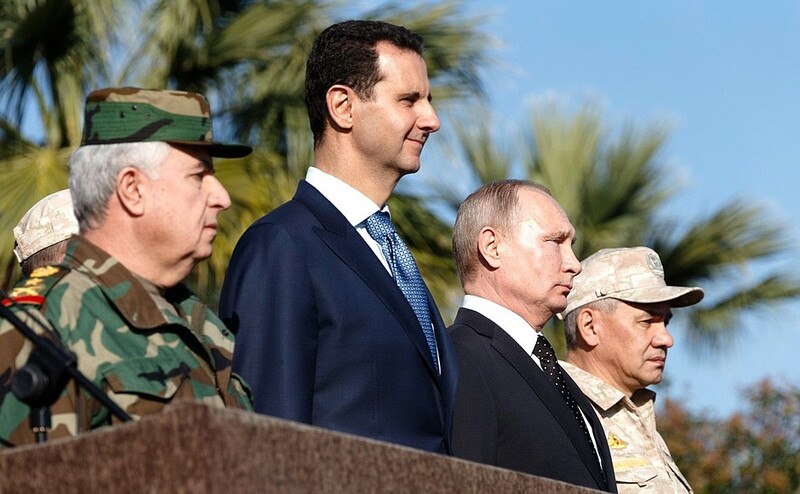 Putin announced the beginning of the withdrawal of "a significant portion" of Russian forces from Syria, claiming that Russia's claimed "counterterrorism" operation has been successfully concluded. For the complete English text of Putin's remarks and a series of photographs, see the Russian government press release. Putin also stated that Russia will maintain a permanent presence at Syria's Humaymim air base and the Tartus naval facility. The Russians were able to reach an agreement with the Syrian government of Bashar al-Asad for a renewable 49-year lease on the two facilities. This constitutes Russia's first permanent overseas deployments to the region since the collapse of the Soviet Union. 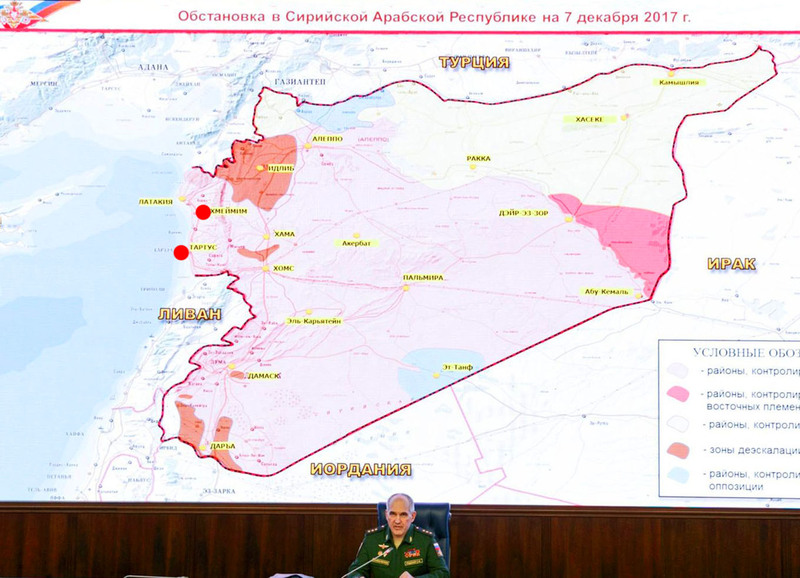 This is a Russian map of the military situation in Syria in early December. I have placed two red dots to indicate the location of Humaymim air base (south of the port city of Latakia) and the Tartus naval facility further to the south. With Putin's recent agreement with Egyptian President 'Abd al-Fatah al-Sisi on Russian Air Force access to Egpytian air bases, the Russians intend to reassert themselves as a power in the Middle East. Back to the Russian fiction about the reasons for the their involvement in Syria since September 2015. Although the stated reason for the deployment of Russian air power, naval units, ground troops and special forces was to join the fight against the Islamic State in Iraq and Syria (ISIS), the underlying reason was to prevent the defeat of the government of Bashar al-Asad. 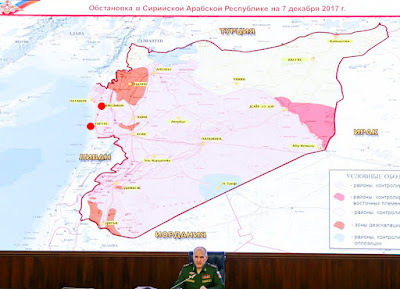 I believe that Putin does not care who is the leader of Syria, as long as that leader is willing to provide bases for the Russian military and will do Moscow's bidding in the region. For now, that happens to be Bashar al-Asad, so Putin will ensure that al-Asad remains in power. As ISIS nears the loss of all of its territorial holdings in Syria (as well as in neighboring Iraq), Putin has emerged as one of - if not THE - key power brokers in the country. Not only is he Bashar al-Asad's guarantor, he has hosted several international conferences on the future of Syria. The participants in these talks have been the Syrian government and representatives of Russia, Iran and Turkey - the United States has almost no role in the discussions that will shape the future of Syria. This is not coincidental, this is Vladimir Putin continuing to outplay the Trump Administration much as he outplayed Barack Obama. As the last pockets of ISIS resistance in Syria are eliminated, the Syrian government (backed by its now majority Iranian, Hizballah and Iraqi militias force) will begin to reassert its authority over all of the country. This includes the 25 percent of the country under the control of the Syrian Democratic Forces (SDF), a largely Kurdish force supported, funded and equipped by the United States. Unlike in neighboring Iraq, the Kurds in Syria have no official standing. Bashar al-Asad has refused to grant any form of autonomy to the Kurds, despite their significant contribution to the defeat of ISIS. The near-term future in Syria is not hard to predict. The Russians, Iranians and Turks are pulling the strings on which Bashar al-Asad will dance. The Russians will ensure that in the political settlement that will eventually evolve, Bashar will remain in power. The Iranians will emerge as the political power behind the throne, completing the "Shi'a Crescent" extending from Tehran through Baghdad and Damascus to Beirut. The Turks will ensure that the Kurds in northern Syria are granted no official recognition or autonomy and will likely maintain forces in Aleppo and Idlib governorates to enforce that goal. What role will the United States play? I seriously doubt there will be much of one, despite senior U.S. military officials' claims of a continued American presence in Syria. The Syrians (urged and supported by the Russians, Iranians and Turks) will demand the United States withdraw its forces from Syrian territory. Since there is no longer an ISIS threat, on what grounds can the United States maintain a force presence? Is Washington willing to instigate a confrontation with Turkey and Russia over Syria's Kurds? In any case, how would the United States support military operations there? It is not far-fetched to think that Iraq - with Iranian urging - will ask the United States to leave Iraq as well. See my earlier analysis: American presence in post-ISIS Syria - not likely. Well played, Mr. Putin, well played. Want to be a martyr? Reserve here! Iranian weapons in Yemen - is anyone surprised?